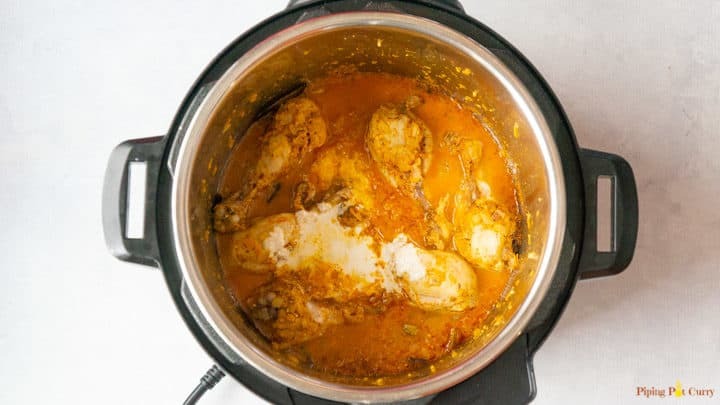 Quick and Easy Chicken Korma made in the Instant Pot or Pressure Cooker. Chicken marinated in yogurt and spices, then cooked with lots of onions and finished with cashew paste for a creamy rich texture. Creamy, full of flavor and spices, this Chicken Korma is a must try! This is a restaurant style chicken curry. What better than enjoying it in the comfort of your home on a week night! 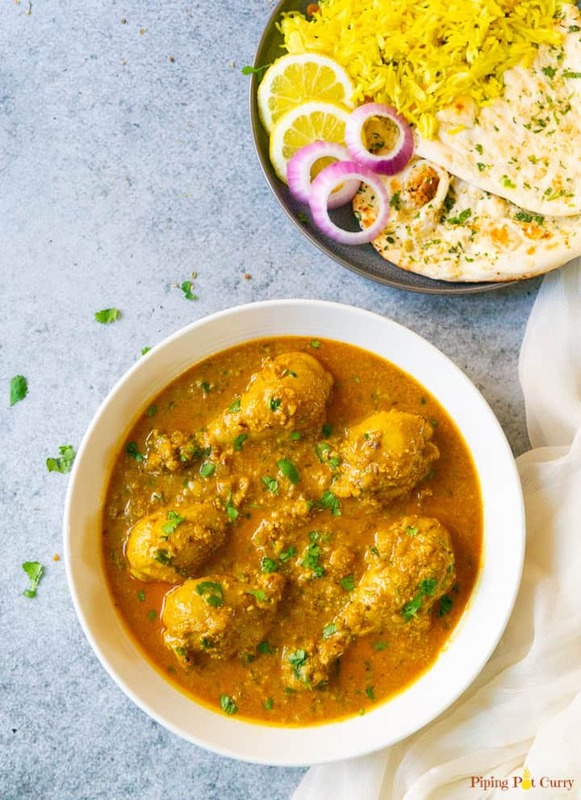 Yes, it takes just 30 minutes to make this Chicken Korma in the Instant Pot (with a little marination prep). Korma is a dish that has its roots in the Mughlai cuisine of the Indian subcontinent. 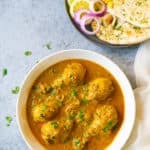 It is a mildly spiced Indian curry dish of meat, fish or vegetables marinated in yogurt or cream and spices, then finished with almonds, cashews or other nuts to make a thick creamy sauce. 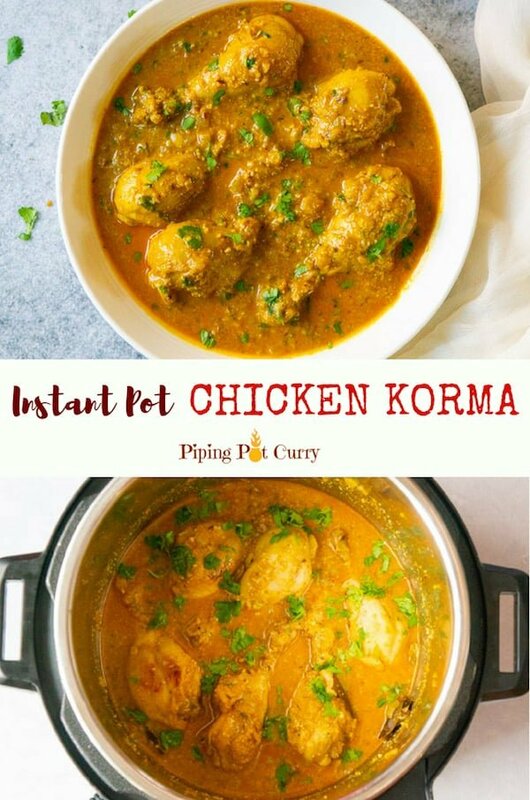 I wanted to share a recipe featuring chicken drumsticks, and this Chicken Korma was perfect with drumsticks. It can also be made with boneless chicken by adjusting the cooking time. How is Chicken Korma different than other Chicken Curries? Chicken is marinated in yogurt for the korma. In this korma, chicken is cooked only with onions. No tomatoes are added, however chicken marinated in yogurt gives a delicious tangy taste. Korma is creamy, so we add nut paste. I use cashews, however you can also use almonds or even finish with coconut milk to make it nut free. Let’s start with marinating the chicken. You will find lots of recipes where this step is skipped, however I feel that it really adds to the taste and makes the chicken so tender and flavorful. We don’t have to keep it for long, just about 30 minutes is perfect. If you want to prep, you can keep the marinated chicken refrigerated for up to 8 hours. Soak cashews in warm water, before you start cooking the curry. 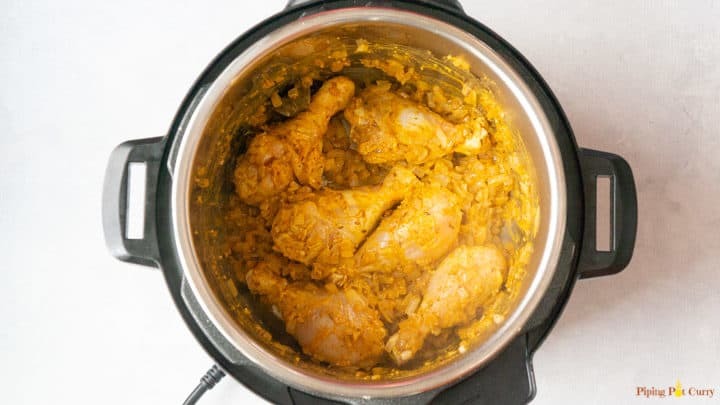 In the instant pot, start with tempering the whole spices in ghee or oil. Then sauté onions along with ginger and garlic. After sautéing for a few minutes, add in the marinated chicken. We want to saute the chicken with the onions for a few minutes. This helps to seal in the flavors and cook the yogurt before pressure cooking. Then pressure cook the chicken curry. We will quick release, so that the chicken does not get over cooked. While the chicken is cooking, blend the cashews to a paste. Stir in the paste to the cooked chicken. This will make a curry creamy. I used chicken drumsticks in this recipe, but any chicken with bones can be used. If using boneless chicken thigh or breasts, adjust cooking time. This curry is to be cooked for 6 minutes at high pressure. This is perfect cooking time if you want to cook rice pot-in-pot along with the chicken. See this Dal Fry recipe where I cook basmati rice with the lentils. 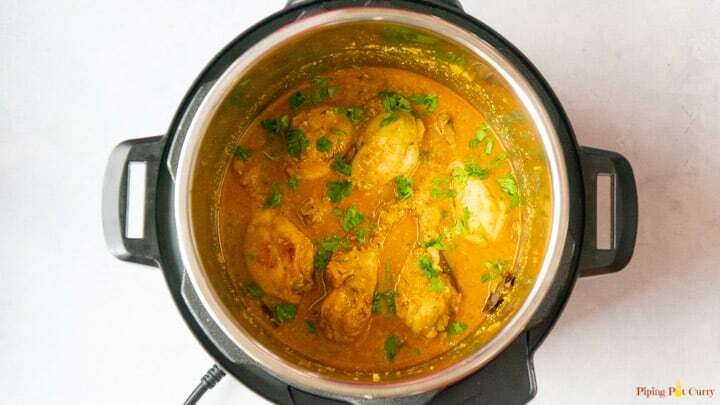 Enjoy this Chicken Korma with naan or basmati rice. Chicken marinated in yogurt and spices, then cooked with lots of onions and finished with cashew paste for a creamy rich texture. This restaurant style chicken curry is quick and easy to make in the Instant Pot. 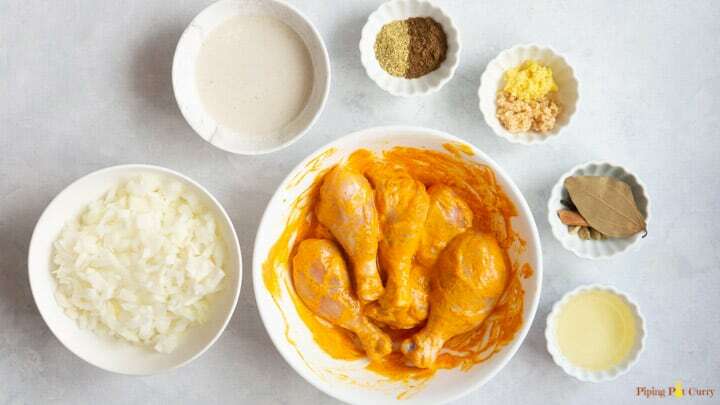 Marinate chicken with yogurt, turmeric, red chili and salt. Refrigerate for 30 minutes. Soak cashews in warm water while the chicken is marinating. Blend cashews with water to a smooth paste. Start the instant pot in sauté mode. Add oil and whole spices. Saute for 30 seconds. Add onion, ginger, garlic and sauté for 3 minutes. Stir in the spices. Add marinated chicken and sauté for 3-4 mins. We want the yogurt to cook before pressure cooking the chicken. Add water for cooking. Stir well and deglaze the pot. Press Cancel and close lid with vent in sealing position. Start on Manual/Pressure Cook mode at high pressure for 6 minutes. When the pressure cooker beeps, press cancel and quick release the pressure manually. Add cashew paste to the chicken and mix well. Garnish with cilantro. Enjoy over rice or with naan. For boneless chicken thigh or breast pieces, pressure cook for only 4 minutes. If you don't like whole spices in the curry, you can use a spice pouch. Top with roasted sliced almonds and raisins, to make it like Shahi Chicken Korma. Usually in Korma we blend the onions to make a nice smooth texture. 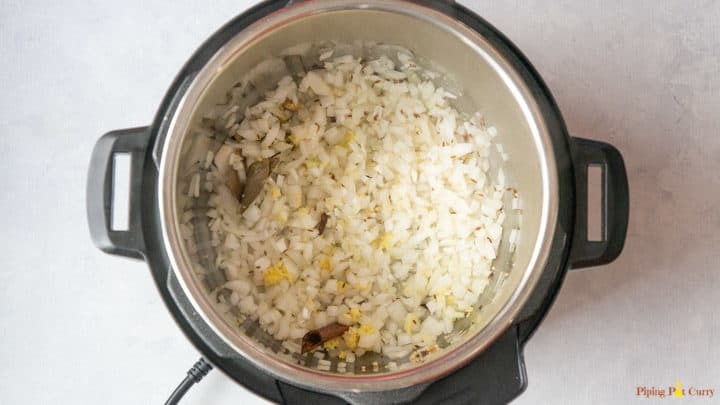 Is it not required in making in instant pot? Hey Nausheen – I feel the onions do cook well and mix in after pressure cooking. However you can definitely puree and add them too in this recipe. Hope you enjoy the Korma! This looks delicious! I am eager to try, but wondered about substituting coconut milk for the cashew paste? Will that still give the flavor and consistency of korma? If so, how much and when is it best to add when cooking? Thank you! Hey Sumita – Coconut milk will work and will be delicious. It might not make the korma as thick, but still a good consistency. I would add the coconut milk after pressure cooking. After adding just give a quick boil on sauté mode. Hope you enjoy the korma! Thank you! Any suggestion on how much coconut milk to use? I can’t wait to try it! It looks so delicious 😍 my mouth is totally watering right now at night xo Btw, I do not think no tomato is added into chicken korma is right, maybe you are talking about the original korma, aren’t you? I am a vegetarian and had several Japanese eggplant that I used instead of the chicken. It was delicious! You could use carrots and cauliflower and I think that parsnips would be yummy too. I love that it is tomato free. Thanks so much for creating this fab recipe! Hey Guru – So glad to hear you were able to customize this recipe to vegetarian with all the wonderful veggies. Thank you for sharing back your review! This was sooo good! I’m extremely happy to have found your website 🙂 keep the recipes coming! I just made this and was totally blown away. It really tasted like the korma thats served at parties or weddings. Good job. Please provide Nihari recipe for IP If you don’t have this already. Hey Bob – So happy to hear you enjoyed the Chicken Korma. I don’t have a Nihari recipe yet, but will definitely add it to my list. Thank you for sharing back your review! Can a mild version be made for children without marinating in chilli powder? If so can chilli powder be added at the end? Hey Risha – Sure, you can always skip or reduce chili powder for kids. The only change might be that the color will be lighter, but the taste should still be as good. Hope you all enjoy it!